Emmanuel Jean-Michel Frédéric Macron is a French politician serving as President of the French Republic and ex officio Co-Prince of Andorra since 2017. He previously was Minister of the Economy, Industry and Digital Affairs from 2014 to 2016. In French architecture, a flèche is a lead-covered timber spire, or spirelet. These are placed on the ridges of church or cathedral roofs and are usually relatively small. However, larger versions can be found on cathedrals such as Amiens Cathedral, Coventry Cathedral, and previously Notre Dame de Paris, before its collapse in a 2019 fire that also destroyed the roof. The highest flèche in the world was built at the end of the 19th century for Rouen Cathedral. Its height is 157 metres (515 ft). 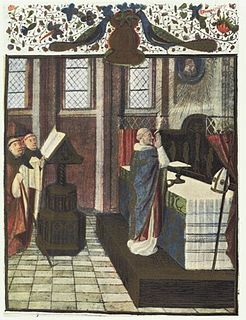 The Mass, known more fully as the Most Holy Sacrifice of the Mass is the central liturgical ritual in the Catholic Church where the bread and wine are consecrated and become the body and blood of Christ. As defined by the Church at the Council of Trent, in the Mass, "The same Christ who offered himself once in a bloody manner on the altar of the cross, is present and offered in an unbloody manner." The Church describes the Holy Mass as "the source and summit of the Christian life". It teaches that through consecration by an ordained priest the bread and wine become the sacrificial body, blood, soul, and divinity of Christ as the sacrifice on Calvary made truly present once again on the altar. The Catholic Church permits only baptised members in the state of grace to receive Christ in the Eucharist. ↑ Issued via the Cathedral's Twitter account under the hashtag, #NotreDameCathedral. Chartres is a commune and capital of the Eure-et-Loir department in France. It is located about 90 km (56 mi) southwest of Paris. Chartres is famous world-wide for its cathedral. Mostly constructed between 1193 and 1250, this Gothic cathedral is in an exceptional state of preservation. The majority of the original stained glass windows survive intact, while the architecture has seen only minor changes since the early 13th century. Much of the old town, including the library associated with the School of Chartres, was destroyed by bombs in 1944. The Île de la Cité is one of two remaining natural islands in the Seine within the city of Paris. 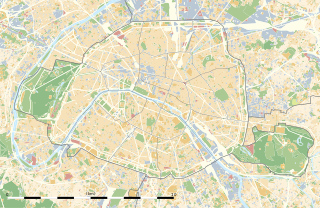 It is the centre of Paris and the location where the medieval city was refounded. François Pinault is a French billionaire businessman, the majority shareholder and honorary chairman of the retail conglomerate Kering, and art collector. The Collectivity of Saint Martin, commonly known as simply Saint Martin, is an overseas collectivity of France in the West Indies in the Caribbean. With a population of 36,286 on an area of 53.2 square kilometres (20.5 sq mi), it encompasses the northern 60% of the divided island of Saint Martin, and some neighbouring islets, the largest of which is Île Tintamarre. The southern 40% of the island of Saint Martin constitutes Sint Maarten, since 2010 a constituent country of the Kingdom of the Netherlands. This marks the only place in the world that France borders the Netherlands. La République En Marche!, sometimes called En Marche!, is a centrist, liberal and social-liberal political party in France. It was founded on 6 April 2016 by Emmanuel Macron, a former Minister of Economy, Industry and Digital Affairs, who was later elected President of the French Republic in the 2017 election with 66.1% of the second-round vote. Macron considers La République En Marche! to be a progressive movement, uniting both the left and the right. On 6 June 2017, at around 16:00 CET, French police shot a man who attacked a police officer with a hammer outside Notre-Dame de Paris cathedral on the Île de la Cité, located in the centre of Paris. The man injured the officer with the hammer, and was found to be in possession of kitchen knives. French police opened a terrorism investigation. 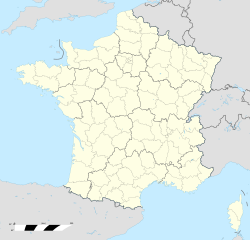 This article lists major events that happened in 2019 in France. Andrew J. Tallon was an art historian. He used lasers to create a precise model of Notre-Dame de Paris, among other buildings. ↑ "Notre-Dame fire: Millions pledged to rebuild cathedral". BBC News. 16 April 2019. Retrieved 17 April 2019. 1 2 "France vows to rebuild Notre Dame Cathedral after devastating fire — live updates". CBS News. Retrieved 16 April 2019. 1 2 3 4 5 "What We Know and Don't Know About the Notre-Dame Fire" . The New York Times . 15 April 2019. Archived from the original on 16 April 2019. Retrieved 15 April 2019. 1 2 El-Bawab, Nadine (15 April 2019). "Paris' Notre Dame 'saved from total destruction,' French fire official says, after blaze ravages cathedral". CNBC. Archived from the original on 15 April 2019. Retrieved 15 April 2019. ↑ Okey, Thomas (1919). The Story of Paris. J.M. Dent & Compan. p. 308. Retrieved 18 April 2019. ↑ Flynn, Meagan (16 April 2019). "The story behind the towering Notre Dame spire and the 30-year-old architect commissioned to rebuild it". The Washington Post. Retrieved 16 April 2019. ↑ "Paris, Banks of the Seine". UNESCO. Retrieved 16 April 2019. ↑ Horgan, Rob (15 April 2019). "Notre-Dame fire: Blaze breaks out amid renovations at 12th century cathedral". New Civil Engineer. Retrieved 16 April 2019. ↑ "Fire breaks out at top of Notre Dame Cathedral in Paris". The Irish Independent. 15 April 2019. Retrieved 16 April 2019. ↑ "Notre Dame was undergoing $6.8 million renovation when massive fire broke out". CBS News. 15 April 2019. Archived from the original on 15 April 2019. Retrieved 15 April 2019. 1 2 "Notre-Dame Cathedral spire in Paris collapses, engulfed in flames". CBC News. Thomson Reuters. 15 April 2019. Archived from the original on 15 April 2019. Retrieved 15 April 2019. ↑ Villasanta, Arthur (16 April 2019). "Notre Dame Cathedral Fire Photos: Macron Vows To Rebuild 670-Year Old Church". International Business Times . Retrieved 16 April 2019. 1 2 Vandoorne, Saskya (16 April 2019). "Timeline of Notre Dame alarms emerges". CNN. Retrieved 16 April 2019. 1 2 3 4 Hinnant, Lori (16 April 2019). "Shock, sadness, but no panic: Minutes that saved Notre Dame". AP NEWS. ↑ "Événements pour avril 2019" (in French). Notre Dame de Paris. Archived from the original on 16 April 2019. Retrieved 15 April 2019. 1 2 3 4 5 6 7 8 Quinn, Ben; Quinn, Ben; Elgot, Jessica; Chrisafis, Angelique (16 April 2019). "Notre Dame: experts assess damage after fire extinguished – live updates". The Guardian. ISSN 0261-3077 . Retrieved 16 April 2019. 1 2 3 4 5 6 7 Nossiter, Adam; Breeden, Aurelien (15 April 2019). "Notre-Dame Cathedral in Paris Catches Fire" . The New York Times. ISSN 0362-4331. Archived from the original on 15 April 2019. Retrieved 15 April 2019. ↑ Hinnant, Lori; Petrequin, Samuel (15 April 2019). "Massive fire engulfs beloved Notre Dame Cathedral in Paris". AP News. Retrieved 16 April 2019. 1 2 3 "Notre-Dame: Massive fire ravages Paris cathedral". BBC News . 16 April 2019. Retrieved 17 April 2019. ↑ "La catedral de Notre Dame de París sufre un importante incendio". El País (in Spanish). 15 April 2019. ISSN 1134-6582. Archived from the original on 15 April 2019. Retrieved 15 April 2019. 1 2 3 4 5 6 Breeden, Aurelien; Peltier, Elian; Alderman, Liz; Pérez-Peña, Richard (16 April 2019). "Notre-Dame Attic Was Known as 'the Forest.' And It Burned Like One". The New York Times. 1 2 3 4 "Six questions sur l'incendie de Notre-Dame de Paris" [Six questions about the fire of Notre-Dame]. Le Parisien (in French). Retrieved 16 April 2019. 1 2 Berlinger, Joshua (16 April 2019). "Why the Notre Dame fire was so hard to put out". CNN. Retrieved 16 April 2019. ↑ "400 firefighters mobilized for Notre Dame blaze". CNN. 15 April 2019. Retrieved 15 April 2019. ↑ "Fire at Notre Dame Cathedral under control; firefighters have saved cathedral's towers". NewsChannel5 Nashville. 15 April 2019. Retrieved 15 April 2019. ↑ "Cathedral fire under control after spire and roof destroyed – as it happened". The Guardian. Retrieved 16 April 2019. 1 2 Capps, Kriston; O'Sullivan, Feargus (15 April 2019). "How Catastrophic Is the Notre-Dame Cathedral Fire?". CityLab. Retrieved 16 April 2019. ↑ Berlinger, Joshua (16 April 2019). "Why the Notre Dame fire was so hard to put out". CNN . Retrieved 16 April 2019. ↑ Navarro, Alyssa (17 April 2019). "French Firefighting Robot Colossus Helped Save Burning Notre Dame Cathedral". Tech Times. Retrieved 17 April 2019. ↑ Hjelmgaard, Kim; Rosman, Rebecca; Garrison, Joey (16 April 2019). "'The fire is out': Paris firefighters succeed after 12-hour battle to extinguish Notre Dame Cathedral blaze". USA Today . Retrieved 16 April 2019. ↑ Hinnant, Lori (16 April 2019). "Shock, sadness, but no panic: Minutes that saved Notre Dame". AP News. Retrieved 16 April 2019. ↑ "'Significant fire' underway at Notre Dame Cathedral in Paris". Euronews . 15 April 2019. Archived from the original on 15 April 2019. Retrieved 15 April 2019. 1 2 "How the Notre-Dame Cathedral Fire Spread" . The New York Times . 15 April 2019. Retrieved 15 April 2019. 1 2 3 Lapin, Tamar (15 April 2019). "Photos show center of Notre Dame cathedral miraculously intact". New York Post. ↑ Prior, Ryan (15 April 2019). "The entire wooden interior of Notre Dame Cathedral has been destroyed". CNN. 1 2 3 4 "Incendie de Notre-Dame de Paris : ce qui a été perdu et ce qui a été sauvé". Le Monde (in French). Agence France-Presse. 16 April 2019. Retrieved 16 April 2019. ↑ Sasuke (15 April 2019). "Notre-Dame de Paris : toute la charpente en feu, la flèche effondrée". Maliactu (in French). ↑ Pyror, Ryan (15 April 2019). "The entire wooden interior of Notre Dame Cathedral has been lost". CNN. Archived from the original on 15 April 2019. Retrieved 15 April 2019. ↑ Kamin, Blair (15 April 2019). "Why people wept as Notre Dame Cathedral burned". Column. Chicago Tribune. Retrieved 16 April 2019. ↑ "Notre-Dame fire: Treasures that make it so special". BBC News. 16 April 2019. Retrieved 17 April 2019. ↑ Gill, Joshua (15 April 2019). "Why Couldn't Firefighters Douse The Flames Of Notre Dame Cathedral?". The Daily Caller. Retrieved 16 April 2019. ↑ "NOW: French official says "both towers of the cathedral are safe" and the fire is cooling". CNN. 15 April 2019. Retrieved 15 April 2019. ↑ Hignett, Katherine (16 April 2019). "Notre Dame "miracle"? Rose windows' stained glass appears to have survived savage blaze". Newsweek. Retrieved 17 April 2019. ↑ White, Sarah; Pineau, Elizabeth (16 April 2019). "Notre-Dame's famed rose window spared but blaze harms priceless artworks". Reuters. Retrieved 17 April 2019. 1 2 Guyonnet, Paul (16 April 2019). "Notre-Dame: Les vitraux des rosaces ont survécu à l'incendie". Huffington Post France (in French). Retrieved 16 April 2019. ↑ "Clôture du chœur" (in French). Notre Dame de Paris. 1 2 Martichoux, Alix (15 April 2019). "What's inside the Notre Dame Cathedral in Paris". San Francisco Chronicle. Archived from the original on 15 April 2019. Retrieved 15 April 2019. ↑ Hartley-Parkinson, Richard (16 April 2019). "Notre Dame crown of thorns and St Louis tunic saved from cathedral fire". Metro . Retrieved 16 April 2019. 1 2 Buncombe, Andrew (15 April 2019). "Notre Dame's historic statues safe after being removed just days before massive fire". The Independent. Archived from the original on 15 April 2019. Retrieved 15 April 2019. 1 2 3 Lough, Richard; Pineau, Elizabeth (16 April 2019). "No sign of arson in Notre-Dame blaze as nation grieves for symbol". Reuters . Retrieved 16 April 2019. ↑ McAuley, James; Whitt, Griff (15 April 2019). "Notre Dame Cathedral spire collapses as Paris monument is consumed by fire". The Washington Post . Archived from the original on 15 April 2019. Retrieved 15 April 2019. ↑ "Notre-Dame counts cost as daylight reveals damage". Yahoo! News. Agence France-Presse. 16 April 2019. Retrieved 16 April 2019. ↑ ""Paris Is Beheaded": Macron Vows To Rebuild Notre Dame After Horrific Fire; Interior Largely Spared". Zero Hedge. ↑ "Fire damage inside Notre Dame Cathedral". NBC4i.com. WCMH. 16 April 2019. 1 2 Marshall, Alex; Stack, Liam; Murphy, Heather (15 April 2019). "Notre-Dame: Fate of Priceless Cultural Treasures Uncertain" . The New York Times. ISSN 0362-4331 . Retrieved 16 April 2019. ↑ Pierre, Thomas (16 April 2019). "Le coq de la flèche a été retrouvé". RTL (in French). Agence France-Presse. Retrieved 16 April 2019. ↑ "L'orgue principal de Notre-Dame de Paris miraculeusement préservé" (in French). 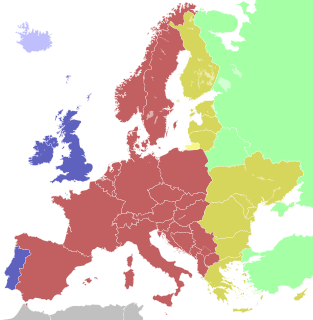 Europe 1. 16 April 2019. Retrieved 16 April 2019. ↑ "Notre-Dame de Paris : une enquête a été ouverte pour "destruction involontaire par incendie"". La Provence (in French). 15 April 2019. Retrieved 15 April 2019. 1 2 3 "The Latest: French leader vows to rebuild damaged Notre Dame". AP News. 15 April 2019. Archived from the original on 15 April 2019. Retrieved 15 April 2019. 1 2 "Notre-Dame : la piste accidentelle privilégiée, les ouvriers du chantier entendus en pleine nuit" [Notre-Dame: prioritized accident investigation, construction workers heard in the middle of the night]. La Depeche (in French). Retrieved 16 April 2019. 1 2 Captain, Sean (15 April 2019). "Notre-Dame fire: Why historic restorations keep going up in flames". Fast Company. ↑ Ganezer, David (April 17, 2019). "Roofer or Welder Starts Fire at Notre Dame de Paris, Building Seems Intact, but Heavily Damages". Santa Monica Observer. Retrieved April 18, 2019. ↑ Morris, James (18 April 2019). "Notre Dame fire: Cathedral blaze was most likely caused by electrical short circuit, police official says". Evening Standard. Retrieved 18 April 2019. ↑ Diebelius, Georgia (18 April 2019). "Notre Dame cathedral fire was 'caused by electrical short circuit'". Metro. Retrieved 18 April 2019. ↑ Miller, Susan (18 April 2019). "Report: Likely cause of Notre Dame Cathedral fire an electrical short-circuit". USA Today. Retrieved 18 April 2019. ↑ Chakraborty, Barnini (18 April 2019). "Notre Dame fire likely caused by electrical short-circuit, investigators believe". Fox News. Retrieved 18 April 2019. ↑ "French President Macron postpones TV address amid Notre-Dame fire". France 24. 15 April 2019. Archived from the original on 15 April 2019. Retrieved 17 April 2019. ↑ Gray, Andrew (15 April 2019). "Macron postpones speech after Notre Dame fire". Politico . Archived from the original on 15 April 2019. Retrieved 15 April 2019. ↑ Kirby, Jen (15 April 2019). "Notre Dame Cathedral, one of Paris's most iconic landmarks, is in flames". Vox. Archived from the original on 15 April 2019. Retrieved 15 April 2019. ↑ Stableford, Dylan (15 April 2019). "Fire erupts at Notre Dame Cathedral in Paris". Yahoo News. Archived from the original on 15 April 2019. Retrieved 15 April 2019. ↑ Jarvis, Jacob (15 April 2019). "Notre Dame fire: Huge fire breaks out at world famous cathedral and sends smoke billowing across Paris". London Evening Standard . Retrieved 15 April 2019. 1 2 Damgé, Mathilde; Dagorn, Gary; Durand, Anne-Aël (16 April 2019). "Nantes, Lunéville, Windsor... les derniers grands incendies de bâtiments historiques". Le Monde (in French). Retrieved 17 April 2019. ↑ "Queen Elizabeth says deeply saddened by Notre Dame blaze". Reuters. 16 April 2019. ↑ "UN chief: 'Horrified by the pictures coming from Paris'". CNN. 15 April 2019. Retrieved 15 April 2019. ↑ "World leaders react to tragic blaze at iconic Notre Dame cathedral". Axios. Archived from the original on 15 April 2019. Retrieved 16 April 2019. ↑ "Germany's Merkel saddened to see Notre-Dame on fire". Reuters. 15 April 2019. Retrieved 16 April 2019. ↑ "Shock, prayers around the world for Notre Dame Cathedral". AP News. 15 April 2019. Archived from the original on 15 April 2019. Retrieved 15 April 2019. ↑ UK Prime Minister [@10DowningStreet] (15 April 2019). "'My thoughts are with the people of France tonight and with the emergency services who are fighting the terrible blaze at Notre-Dame cathedral.' – PM @Theresa_May" (Tweet) – via Twitter. ↑ "Notre Dame fire: Live updates". CNN. 15 April 2019. Archived from the original on 15 April 2019. Retrieved 15 April 2019. ↑ "Presidente da República enviou mensagem ao seu homólogo francês". presidencia.pt (in Portuguese). 15 April 2019. Retrieved 16 April 2019. ↑ "Every damage to Notre-Dame is a painful wound not only to French people, but to the people of Europe". Focus (in Bulgarian). 15 April 2019. ↑ "Orbán expresses sympathies over Notre Dame fire". Hungary Matters. Retrieved 17 April 2019. ↑ "Η δήλωση Τσίπρα για την Παναγία των Παρισίων". Η Εφημερίδα των Συντακτών (in Greek). Retrieved 16 April 2019. ↑ Hinnant, Lori. "Roof and spire collapse as fire engulfs Notre-Dame Cathedral in Paris". Citytv. ↑ Trudeau, Justin [@JustinTrudeau] (15 April 2019). "Absolutely heartbreaking to see the Notre-Dame Cathedral in flames. Canadians are thinking of our friends in France as you fight this devastating fire" (Tweet). Archived from the original on 15 April 2019 – via Twitter. ↑ "President Trump on the 'terrible, terrible fire'". CNN. 15 April 2019. Retrieved 15 April 2019. ↑ "Message to Emmanuel Macron". Russian Presidential Executive Office. 16 April 2019. Retrieved 16 April 2019. ↑ "President Rivlin offers solidarity with France as Notre Dame burns". The Times of Israel . Retrieved 15 April 2019. ↑ "HM King offers solidarity with France". Gulf Daily News. 16 April 2019. Retrieved 16 April 2019. ↑ "Xi sends condolence to Macron over Notre Dame fire". Xinhua News Agency. 16 April 2019. Retrieved 16 April 2019. ↑ "Morocco king vows solidarity with France following Notre Dame Cathedral fire". Xinhua News Agency. 16 April 2019. Retrieved 16 April 2019. ↑ "Sisi expresses solidarity with France over Paris cathedral fire". Egypt Today. MENA. 15 April 2019. Retrieved 16 April 2019. ↑ "Notre Dame Cathedral fire: Akufo-Addo comiserates with France". Graphic Online. 16 April 2019. Retrieved 17 April 2019. ↑ Eyre, Aubrey (15 April 2019). "Hope from ashes: Why the Notre Dame fire is a symbol of rebirth during Holy Week". Church News . Archived from the original on 16 April 2019. Retrieved 16 April 2019. ↑ "Paris archbishop, Holy See call for prayer as Notre-Dame burns". Catholic Voice. Catholic News Agency. 16 April 2019. Retrieved 16 April 2019. ↑ "UNESCO to assist reconstruction of Notre Dame post blaze". Business Standard. 17 April 2019. ↑ "British restoration experts eager to help 'resurrect' Notre Dame after fire". Jersey Evening Post. 16 April 2019. ↑ Watkins, Devin (16 April 2019). "Notre Dame fire: Pope joins Paris in sorrow, Vatican offers technical expertise". Vatican Media. ↑ Blamont, Matthias; de Clercq, Geert (16 April 2019). "In the heart of Paris, a wounded Notre-Dame stirs emotions". Reuters . Retrieved 16 April 2019. ↑ "Parisians sing hymns as they watch Notre Dame burning – video". The Guardian. Reuters/AP. 16 April 2019. ↑ "Stunning video shows people singing hymn to honor Notre Dame as it burned". CBS News. ↑ Collins, Lauren (April 15, 2019). "On the Roof of Notre-Dame, Before It Burned". The New Yorker . Retrieved April 18, 2019. ↑ "Chartres Cathedral – Cathédrale Notre-Dame de Chartres". ↑ Chrisafis, Angelique; Henley, Jon (16 April 2019). "Notre Dame fire: Macron pledges to rebuild devastated Paris cathedral". The Guardian. ISSN 0261-3077 . Retrieved 16 April 2019. ↑ Lam, Kristin (15 April 2019). "The Notre Dame Cathedral will rise again, French President Emmanuel Macron promises". USA Today . Retrieved 16 April 2019. 1 2 Ott, Haley (16 April 2019). "Why an expert says it could take 40 years to rebuild Notre Dame". CBS News . Retrieved 17 April 2019. 1 2 Hussain, Noor Zainab; Arnold, Paul (16 April 2019). "Insurers expect France to bear Notre-Dame rebuilding cost". Reuters . Retrieved 16 April 2019. ↑ Lam, Kristin; Miller, Ryan W.; Rice, Doyle (16 April 2019). "What's next for Notre Dame? Rebuilding. Macron said do it in five years, but it could take decades". USA Today . Retrieved 16 April 2019. ↑ "Notre-Dame: la mairie de Paris débloque 50 millions d'euros". Le Figaro (in French). Agence France-Presse. 16 April 2019. Retrieved 16 April 2019. 1 2 Gabriele, Matthew. "Perspective: Fire was the scourge of medieval cathedrals. But they rebuilt from the ashes". Washington Post. ↑ Brockell, Gillian (16 April 2019). "How Victor Hugo's hunchback of Notre Dame saved the cathedral from ruin in the 1800s". The Independent. ↑ Mondschein, Ken. "Medievalisms: Notre-Dame Cathedral and the Re-creation of the French Past". www.medievalists.net. ↑ Kar-Gupta, Sudip (April 18, 2019). "Steelmaker ArcelorMittal to offer steel for Notre-Dame Cathedral restoration". Reuters . Retrieved April 18, 2019. ↑ Jackson, Patrick (18 April 2019). "How new tech might help Notre-Dame rebuild". ↑ Ott, Haley. "Why an expert says it could take 40 years to rebuild Notre Dame". www.cbsnews.com. ↑ Clarke, Joseph L. "Opinion: The reconstruction of Notre-Dame is not the only answer". ↑ Lenoir, Luc (16 April 2019). "Notre-Dame: près de 700 millions d'euros déjà donnés par les entreprises et les grandes fortunes". Le Figaro (in French). Agence France-Presse. ↑ "Billionaire Arnault's family and LVMH to donate 200 mln euros for Paris' Notre-Dame". Reuters. 16 April 2019. Retrieved 16 April 2019. ↑ "Notre-Dame : LVMH et la famille Arnault annoncent un « don de 200 millions d'euros »". Le Figaro (in French). 16 April 2019. ↑ "Incendie à Notre-Dame : la famille Pinault débloque 100 millions d'euros". Le Figaro (in French). 16 April 2019. ↑ "France-Total fait un don de 100 millions d'euros pour Notre-Dame de Paris". Le Figaro (in French). 16 April 2019. Retrieved 16 April 2019. ↑ "Notre-Dame: la mairie de Paris débloque 50 millions d'euros". courrier-picard.fr (in French). Retrieved 16 April 2019. 1 2 3 4 "Notre-Dame de Paris : cagnottes, promesses de dons et souscription nationale pour financer la reconstruction". Le Monde (in French). 16 April 2019. Retrieved 16 April 2019. ↑ "BNP Paribas, SocGen Join Notre Dame Donor List as Pledges Exceed $790 Million". Market Screener. Retrieved 17 April 2019. ↑ "Le secteur privé promet près de 700 millions d'euros pour reconstruire Notre-Dame". Boursorama (in French). Retrieved 16 April 2019. ↑ "AXA s'associe à l'élan de solidarité après l'incendie de Notre-Dame de Paris" (Press release) (in French). AXA. 16 April 2019. 1 2 "Plus de 800 millions d'euros de dons pour la reconstruction de Notre-Dame". Les Dernières Nouvelles d'Alsace (in French). Retrieved 16 April 2019. ↑ "Entreprises et grandes fortunes se mobilisent pour la reconstruction de Notre-Dame". La Croix (in French). 16 April 2019. ISSN 0242-6056 . Retrieved 16 April 2019. 1 2 "Le secteur privé promet autour de 700 millions d'euros pour reconstruire Notre-Dame". Boursorama (in French). 16 April 2019. ↑ "The Walt Disney Company Pledges $5 Million to Support Rebuilding of Notre-Dame Cathedral". The Walt Disney Company. 17 April 2019. Retrieved 17 April 2019. ↑ Gray, Sarah; Ma, Alexandra; Martin, Will. "France's superrich join together to pledge over $675 million to help rebuild Notre-Dame, as donations flood in to save the devastated cathedral". Insider . Retrieved 17 April 2019. ↑ "Notre-Dame de Paris : la région Auvergne-Rhône-Alpes va verser deux millions d'euros pour la reconstruction" (in French). France Bleu. 16 April 2019. Retrieved 16 April 2019. ↑ "En Occitanie, les collectivités se mobilisent pour la reconstruction de Notre-Dame-de-Paris". ToulÉco (in French). 16 April 2019. Retrieved 16 April 2019. ↑ "Patrimoine – La Fondation Michelin se mobilise pour la reconstruction de Notre-Dame de Paris". La Montagne (in French). Retrieved 16 April 2019. ↑ "Compania UI Path, „primul unicorn românesc", donează un milion de euro pentru reconstrucția catedralei Notre Dame: „Datorăm mult Franței și culturii franceze. E momentul să dăm ceva înapoi"". Republica.ro (in Romanian). Retrieved 17 April 2019. ↑ Gach, Ethan (17 April 2019). "Ubisoft Pledges More Than $500,000 To The Notre-Dame Cathedral Restoration Effort". Kotaku . Retrieved 17 April 2019. ↑ Hartocollis, Anemona (16 April 2019). "Notre Dame, the University, Knows What It's Like to Be Devastated by Fire". The New York Times. Retrieved 16 April 2019. ↑ "SRO contributes €50,000 towards Notre-Dame restoration". RACER. 16 April 2019. Retrieved 17 April 2019. ↑ "Notre-Dame: plus de 800 millions d'euros déjà donnés par les entreprises et les grandes fortunes". Le Figaro (in French). Retrieved 16 April 2019. ↑ Soisson, Lucy Handley, Isabel (16 April 2019). "Apple joins French firms in pledging millions to rebuild Notre Dame after fire". CNBC. Retrieved 17 April 2019. ↑ Cook, Tim (16 April 2019). "We are heartbroken for the French people and those around the world for whom Notre Dame is a symbol of hope. Relieved that everyone is safe. Apple will be donating to the rebuilding efforts to help restore Notre Dame's precious heritage for future generations". @tim_cook. Retrieved 18 April 2019. ↑ "Tweet from Autodesk CEO Andrew Anagnost". 16 April 2019. Wikimedia Commons has media related to 2019 Notre-Dame de Paris fire .